Okay, I admit it! I knew about IronQuest before it was announced. I'm finally coming clean! The truth is, I consider Sarah Bartlett a good friend. Although we've only hung out at TC18 and she lives in an entirely different country, we often bounce ideas off each other and just love to talk about all things data. In mid-December, she reached out to me and told me about IronQuest and asked if I would like to participate. I was super excited because 1) she reached out to me in hopes I would participate and 2) because I think that IronQuest is an incredible idea! According to Sarah's website, IronQuest "aims to give individuals an opportunity to practice both their data sourcing, data preparation and data visualization skills without the pressure that comes with participating in a competition like IronViz." Basically, this will give people an incredible practice round to prepare for IronViz and to encourage the community to participate. I think it's an amazing idea because I've heard so many people quote their reason for not competing is the doubt of their skills. I truly believe this will help people feel more comfortable to get involved and compete. And let me tell you from personal experience, IronViz is the best learning experience you can ever have. Ever! I strongly encourage you to check out Sarah's website to learn more about the initiative. For a while now, I've wanting to do an infographic type visualization. I think there are mixed feelings about infographics in the dataviz community, but I love the design aspect and the way they quickly capture and engage the audience with little effort from the reader. A few months ago, I had stumbled across an infographic that I really liked and wanted to, at some point, put my spin on it. The infographic was related to saving energy and was developed by Halcyon. I was unable to find the actual graphic on their website, but I did find it on Infographics Showcase. I ultimately built the entire background image using PowerPoint (I'd be happy to share that if anyone is interested). Similar to what Neil Richards talked about in his Design-Driven-Data presentation at TC18, I had a design in place long before I had any data to go with it. The topic for the first IronQuest is crime. When Sarah told me this, only one idea came to mind, Drunk Driving. 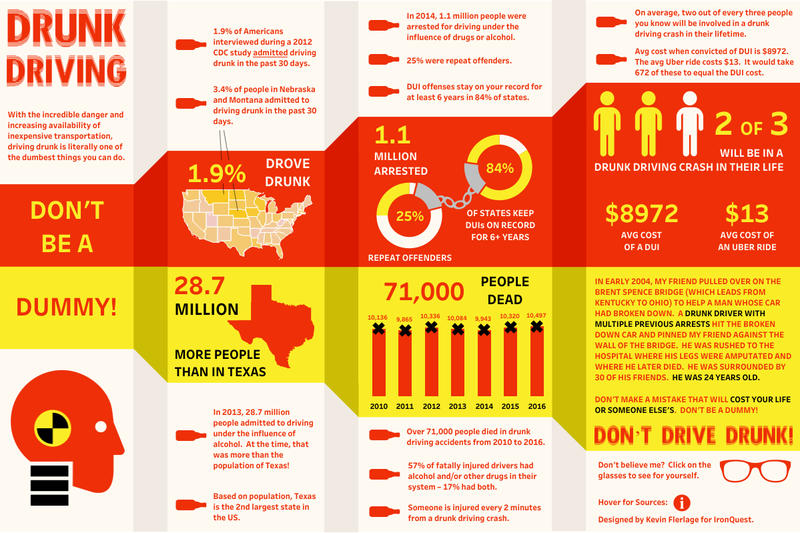 Drunk Driving is a crime that kills several thousand people every year. One of those people was a friend of mine, a law student that pulled over on the side of the road to help another person with their broken-down vehicle. A drunk driver with multiple previous DUIs, hit the broken-down car and took my friend's life in the process. He was just 24 years old. My hope with this viz is to play some part in getting people involved in IronViz, but also to encourage readers to not drink and drive. You have too much to lose and the people around you have too much to lose. So, without further ado, I present my IronQuest submission: Drunk Driving. As a side note, this visualization was built with an infographic in mind, but it does have some neat interactive features. Make sure to go through the entire viz and don't just view the main page. There is much more to it than just that. As always, if you have any questions, please feel free to reach out to me at any time. Great blog post Kevin. While I don't have the drive to tackle Iron Viz itself I definitely can learn a lot from this. You should. Only one will win, but it is a fantastic learning experience. Plus if this is the Zach I think it is, you're simply too good not to compete!